Maybe, calling my open source web designer and developer contract a “Killer” wasn’t such a smart idea? This week at Smashing Conference in New York, I had the very great pleasure of meeting Chris Lilley. I recognised Chris’ name, but it took me a day to remember that he had been the chairman of the ‘Style and Formatting Properties Working Group’ at the W3C, a precursor to the CSS Working Group. Chris is a hugely important person in the history of the web. It’s amazing to think that John Allsopp’s oft-quoted article, A Dao of Web Design was published fifteen years ago today. A List Apart asked me what John’s article means to me now, but rather than focus on Dao’s flexible design principles, I wanted to talk about a passage that never seems to get a mention. Ten years ago, in 2005, my friend Drew MacLellan asked if I would contribute a short article to the then new 24ways, “advent calendar for web geeks” and “a daily dose of web design and development goodness” throughout December. We’re half-way through a project, designing a web ‘application’ for a client. This means writing lots of HTML and making plenty of template pages. My blog is ten years old today. Of course Stuff and Nonsense as a company is older than that by a few years, but today, ten years ago, on May 13th *, I rolled out the welcome mat on the new site. What can I say? Thank-you. So very much. From all of us. You voted and Stuff and Nonsense has been shortlisted, in the top five, for Agency Of The Year at the Net Magazine awards 2014. I can’t tell you how much that means to us. Whatever happens during the next phase, the judges’ voting stage, you made us feel special and we’re starting the week with the biggest smiles on our faces. Well, not quite yet, but later this month. They’ve been going from strength to strength and while there hasn’t been a blockbuster book since Hicks’ Icon Handbook, their Pocket Guides series contains some real gems. They’ve updated their site ready for the birthday celebrations and a little bird tells me they’ll soon be celebrating with a sale, starting next week. That will be a great time to pick up that copy of Hardboiled Web Design you haven’t got around to buying. Never fear, web design generalists: many companies and organizations require your services and always will — from universities still seeking webmasters, to startups seeking seasoned folks with multiple areas of understanding to direct and coordinate the activities of younger specialists. But if jack-of-all web work is feeling stale, now may be the time to up your game as a graphic designer, or experience designer, or front end developer. “Diversify or die” is overstating things when the world needs generalists, too. But “follow the path you love” will always be good advice. Talking with Dan on this week’s Unfinished Business got me thinking about photography and workshops and wanting to learn to make better photographs. Two weeks before Christmas I took a train to Birmingham to meet a new client. After our meeting I wandered to the Bull Ring and went into the Dr. Martens shop there to buy a new pair of boots. The Net Awards returns for 2014, but unlike previous years, this time I’d actually appreciate your vote. Should you buy Hardboiled Web Design for information about responsive web design? Bob Asbille asked me this week if my Hardboiled Web Design book is worth buying by someone who’s looking to learn about responsive web design. Talking to Dan Cederholm on Unfinished Business this coming week, our conversation to book writing, in particular working on second, maybe even third editions of books we wrote years ago. It seemed apt to post these lyrics today. My person favourite version of this song is on Billy Bragg’s Tooth & Nail album. Listen on Spotify. I’ve lived with the new video feature in Instagram for about a week and while I was originally sceptical about whether video and Instagram would be a good match, I thought it best to wait a while before forming an expressing an opinion. I can remember the first cigarette I ever smoked. It was 1983 and on my way to art foundation one day, I stopped my car at Kettering railway station and bought a packet of ten Benson & Hedges and a box of Swan matches. I pulled on the cellophane band, tore off the top and flipped open the golden box. I’ll never forget the smell of tobacco that rises from a freshly opened pack or the bitter smell of a match. I slipped a cigarette between my lips, struck a match and lit it. After last week’s episode of Unfinished Business, Laura Kalbag wrote two good posts on mentoring. I spent last week in Geneva. Nothing out of the ordinary about that as I’ve been working there fairly regularly over the last couple of years. But last week was my birthday week — Tuesday. 47. A new wallet. Thanks for asking — so they had to be very special people to persuade me to spend the week with them. They were. Good honest folk. After I posted my review of Hammer – the simple to use, GUI app that helps me design with HTML – this week, several people tweeted a few alternatives. Oooh, oooh, let’s go look! Although Adobe have said nothing officially, their silence says it all. Unofficially my little birdies tell me that Fireworks is not being updated for retina displays so the tool I’ve used and loved for a decade or more is effectively dead. Something strange happened to me on Twitter today. With the help of Tapbots’ Netbot client, it looks like App.net might be gathering steam. If App.net’s your thing, you’ll now find me there too although I guess I’m not alone in being unsure when I’ll use App.net instead of Twitter. The responsive pattern library is meant to be a comprehensive collection of responsive interface patterns created by and collected for the community. Here’s more from Brad Frost. I want his dog. So badly. Adobe announced yesterday that Creative Cloud customers (like me) will receive an upgrade to HiDPI and Retina Display Support. This sounds like great news if you’re a Photoshop or Lightroom user — two apps that will receive the update first — but not if your everyday design app is Fireworks, not Photoshop. There was no mention of when (or more likely if) Fireworks will be upgraded. It’s been a mad couple of weeks since I came back from holiday. This week onsite with my friends at STV and the first spent head down on another project. But before I could get back to work, I had to set up our new studio. Making screenshots for the some portfolio panels for my new site design — It’s out on Wednesday kids — I came across a problem. I couldn’t get screenshots sharp enough for a retina display because I’m snapping on a plain ol’ Macbook Air. I haven’t posted lyrics for a while, but it seemed appropriate this week, both with the news (no pun intended) this week that Rebekah Brooks and Andy Coulson face charges relating to phone hacking and the fact that I put the final, final, final touches to my design for the upcoming Hillsborough Independent Panel’s report into the Hillsborough Disaster that will be launched in September. My beloved Fireworks, now in CS6, encountered an error yesterday and refused to save. My only option was to Force Quit the app and lose half an hour’s work. Hey ho. Then I found out that auto-save might have helped me, maybe lose less work. Here’s what I did. There’s no reason why anyone should have to wait more than 24 hours for the money you owe them, especially people you work with. So the next time you receive an invoice from a contractor or supplier, pay it right away. Don’t wait a month, a week, a day or even an hour longer than you have to. Better still, find out how to pay them before they start any work. That way you can pay them immediately when you receive their invoice. They’ll feel good and so will you. About a year ago, I left day rates and job rates behind and started estimating, billing and working on projects on a weekly basis. A year on and I’m better organised, more productive and less stressed than ever before. Our accounts are in better shape and no one owes us money for longer than a week. It was one of the best business moves I’ve made. I bought a mifi today because I’m working in London a fair bit over the next few months and the client site doesn’t have open wifi. I could stick with the network’s given name, 3MobileWiFi-c602, but ‘Escape From The Planet Of The Apes’ seems much, much more appropriate. I’ve worked for myself for the last fourteen years and for most of that I’ve worked in my office at home. If you’ve been using Twitter and the Twitter app for iPhone for a while, you’ll probably miss having access to your direct messages in the toolbar since Twitter replaced it with the ‘discover’ button (whatever that does.) Don’t worry, because some friends of mine who work at Twitter in San Francisco showed me a way to unlock a hidden power user mode that puts DMs back in the toolbar. When I upgraded my phone to an iPhone 4S it instantly took over as my main camera. I use Camera+ and ProHDR, olloclip lens attachments and POPA and I couldn’t be happier with the results I get. This week I was sat in a hotel in London and uploaded at photo to Instagram. It was a kangaroo I met a couple of weeks ago at a sanctuary near Brisbane. It’s a half decent photo. OMG! KANGAROOS ARE SOOO CUUUTE! But posting the photo felt wrong. I know plenty of people who post Instagram photos from weeks or even months back. But Instagram isn’t Flickr and photos on Instagram should be from today, or at a push from yesterday. Anything else is a Delayagram™. Like, I guess, many people, we leave our computers running when we’re not using them. We keep apps like iChat and Skype running too, with the sound turned up, in case anyone should call. It turns out it’s repeating, recorded spam, coming through Skype. Out of curiosity, I typed w w w dot pee gee em ess gee dot com into my browser. I’ve seen this type of fake virus scanner before, and I use a Mac so I can just laugh at them. Most interesting though is how these tricksters managed to talk to me over Skype without my permission. It turns out this is old news for some people. As you were. 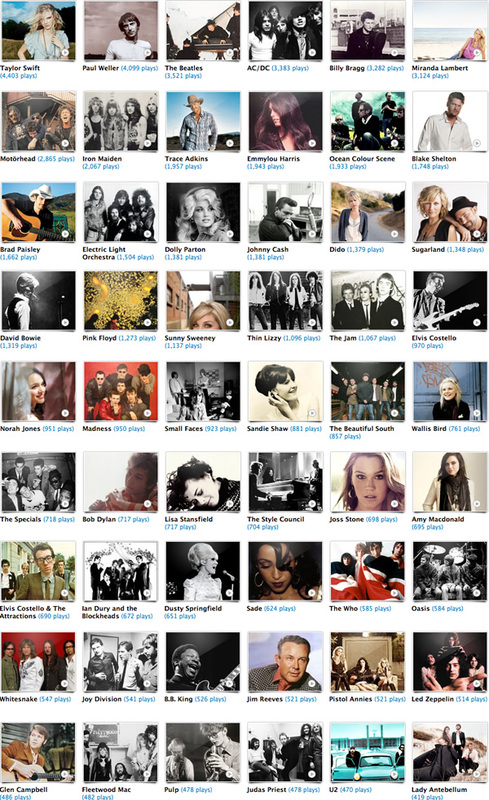 I don’t use Last.fm socially, but I left it scrobbling so it could compile the soundtrack to my 2011. No Ice Cream Sandwich for the Samsung Galaxy Tab 10.1? If I buy a Galaxy Tab 10.1 today, do I get a *timely* over-the-air upgrade to Ice Cream Sandwich for free? This is not guaranteed. Honeycomb was made specifically for the 10.1, so there are no plans for release at present. I guess that I just expected, when I bought my Galaxy Tab 10.1 this summer, that I’d get software updates from Samsung the same way I get them for my iOS devices. Sure enough I did get one — one that replaced stock Honeycomb with Samsung’s own TouchWiz variant — an update I didn’t want but was told that if I didn’t update, I wouldn’t get any upgrades in future. Now it looks like my Galaxy Tab 10.1 — already the most expensive shaving mirror I’ve ever bought — is going to stay stuck in 2011. Does the same go for Tabs still on the shelves of your favourite big box retailer? What about the 10.1N variant I saw in Germany two weeks ago? .Net magazine published its The top 25 books for web designers and developers after asking a few contributors and yours truly for our recommendations. We think of The Verge (and its underlying CMS) as something akin to an app. A piece of software that is being constantly developed and updated. Today we’re launching with The Verge 1.0, but 1.1 and 1.2 are just around the corner. This Is My Next — my favourite tech, gadget site over the last few months — has (right on cue) become The Verge. If you’ve been reading This Is My Next, you’ll know there’s been a lot to like about the quality of its journalism. There’s a lot to like about the new site’s design too, from the strong layout of its review pages to many of the design details. I can see myself spending a lot of time on the Apple hub. I love the category/brand tabs in the review sidebar navigation. They’re not unique, they’re not new, but here they just ‘work’. The ‘jump to’ overlay on product review pages, like this one for the iPhone 4S, just works too. It’s obvious that everyone involved in The Verge cares about the details. Compared to Engadget, Gizmodo or the recent TechCrunch redesign disaster, The Verge’s design is a treat and it looks like a worthy successor to This Is My Next. So far, I love it. Friday night is Geek Ninja Battle Night in Brighton and the topic that Aral “Ken” Balkan, Sarah “Cammy” Parmenter, Remy “Cyclops” Sharp and me (Andy “M(alarkey) Bison” Clarke) are fighting over is Mobile – Web vs. Native! I’m taking the unusual step (for me) of speaking without a slide-deck to back me up, but I’ve prepared an outline for my short talk which might be interesting if you’re not attending. From time to time, I get asked, “Why no index in Hardboiled Web Design?” My usual flippant answer being, “What? You want it even thicker?” Still, I know some people like indexes and the Hardboiled paperback doesn’t have one, (unless you count searching in the PDF version). Steven Milne has taken matters into his own hands with his unofficial Hardboiled Index. I got different two scarves last Christmas, from two different people. But the difference wasn’t the colour, or the fabric, it was the giving. It’s a ??????? ?????? ??? ?, this web design design lark. Who’d have thought that learning a bit of code would’ve meant I got travel around the world and to places I never thought I’d see? I’ve always believed that content on the web should be free (from presentation). My new Macbook Air arrived this evening and it’s the best laptop I’ve ever owned. Less than an hour after unpacking it, it’s already the travelling production powerhouse I wanted. I’m tired. Really tired. Not just the tiredness that comes from back-to-back transatlantic flights crammed into airline seats (although I have another one of those to look forward to today), but the kind of tiredness that goes deep into my bones. After several years of presenting my workshop materials on behalf of other people, on the 1st of September 2008 I announced that I’d be striking out to present my content in my own series of workshop events. I called this aspect of my business For A Beautiful Web. If you own anything made by Apple, you possibly already know about Hard Graft. I’ve been a huge fan of them, their cases and sleeves since a friend introduced me to them a year or so ago. So when Apple announced the iPad, I knew I wanted a Hard Graft case for it. Hell, I wanted a Hard Graft iPad case even before there was an iPad. And now I have one. If you are one of those people who love to complain about old browsers, it’s important to remember just how far browsers have come. Do you occasionally have to explain to a client why the site you made for them using CSS looks different for people who use very old browsing software? You should thank your lucky stars. A simple game time waster (and an old school blog meme). Go to the address bar in your browser and type a letter. Start with “a”, end with “z”. Here is what I found. Some things are best expressed without words. Ambling around a five storey bookstore in the Jinbocho area of Tokyo today, in the computer section I stumbled across a Japanese translation of my Transcending CSS and CSS Best Practice by Miki Ofuji. First a disclaimer. I smoke cigarettes. I know that they are bad for me will probably kill me early or make me ill, but I for now at least I choose to smoke because I like something they give me physiologically. Ooops! The Stuff and Nonsense Theatre Company have printed 20,000 flyers with my URL on them by mistake. As true now as it was in 1986. Yesterday I took a call (and received an email) from a long-standing client. I designed for them in 2001/2. Over the last year, the staff responsible for updating their site had changed, they had mislaid their passwords and they needed help. So help was what they got. A little over a week ago, but what seems like much, much, longer, my wife and I made the long trip from home to Australia to host three Visual Web Design Masterclasses in partnership with our good friends at Web Directions. It proved to be quite a week. I’m currently spending my time writing and preparing content for a new DVD title, Designing Accessibility (For A Beautiful Web), part of a series of DVDs that I am making for New Riders, that will be published sometime in 2009. Running a small business means that I divide my time between the things that I love doing (project planning, designing and dealing with people) and the things that I don’t enjoy so much (business planning, accounting and dealing with (some) people). Nothing drives me crazy like TV ads for insurance comparison web sites (if I hear once more that you don’t have to be a computer wizard to use confused.com, I might just drive over the edge). I promise. In the run up to the opening of the Watchmen movie next year, I will resist the urge to write about or link to every piece of Watchmen trivia. In what I hope will not be a series about the stupid things that clients complain about. Some of you might know that I’ve been passionate about learning to ride large motorcycles for a while and have been taking a DAS course at Pro Bike. While I’ve not yet managed to pass my test (that’s another story), I am determined and today more inspired than ever by an email from my friend Pascal who has just completed a ride from southern France to Beijing and back.